The development of U.S. urban transportation policy over the past half-century illustrates the changing relationships among federal, state, and local governments. This comprehensive text examines the evolution of urban transportation planning from early developments in highway planning in the 1930s to today’s concerns over sustainable development, security, and pollution control. Highlighting major national events, the book examines the influence of legislation, regulations, conferences, federal programs, and advances in planning procedures and technology. 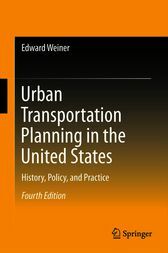 The volume provides in-depth coverage of the most significant event in transportation planning, the Federal-Aid Highway Act of 1962, which created a federal mandate for a comprehensive urban transportation planning process, carried out cooperatively by states and local governments with federal funding. Claiming that urban transportation planning is more sophisticated, costly, and complex than its highway and transit planning predecessors, the book demonstrates how urban transportation planning evolved in response to changes in such factors as the environment, energy, development patterns, intergovernmental coordination, and federal transit programs. This updated, revised, and expanded edition features two new chapters on global climate change and managing under conditions of constrained resources, and covers the impact of the most recent legislation, 50 years after the Highway Act of 1962, emphasizing such timely issues as security, oil dependence, performance measurement, and public-private sector collaboration.